The Scarf and Badge is the holy insignia of the organisation. It represents sacrifice and commitment of the members of the Organisation. All members should necessarily wear scarf and badge while undertaking service activities. 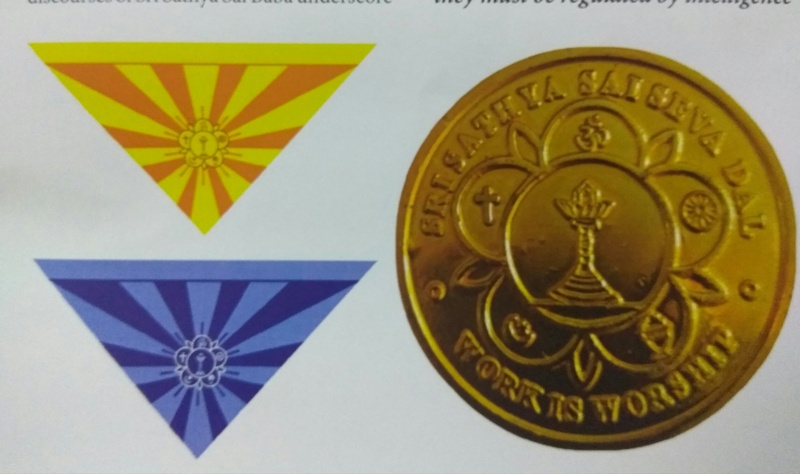 The Scarf (in a combination of light and dark blue for men and yellow and saffron for women has the Sarva Dharma Logo printed in the centre) and the Sevadal badge (a round medallion with the Sarva Dharma Logo and the dictum “Work is Worship” from Sri Sathya Sai Baba inscribed in it) carry a deep message. It signifies that for a member wearing the scarf and badge, adherence to one’s duty with steadfast commitment and dedication is in true sense the worshipping of God. Excerpts from the discourses of Sri Sathya Sai Baba underscore the significance and import of the Scarf and Badge. Divine Discourse, 19 May 1969. “Do not feel that this is an obligation imposed on you by the rules of the Organisation or by the person nominated as your leader. Do not feel that the scarf and badge that you wear are impediments to freedom. They are reminders of the high mission to which you have been initiated, the keys to your Realisation of reality through the saadhana of seva. Do not put the badge in your pocket when your work here is over and the festival in finished, and when you leave for home to resume your old avocations and your discarded habits. This is not a three-day thamaasha (show).